Neil deGrasse Tyson, Real Time with Bill Maher. There’s no greater sign of the failure of the American educational system than the extent to which Americans are distracted by the possibility that Earth might end on December 21, 2012. It’s a profound absence of awareness of the laws of physics and how nature works. So they’re missing some science classes in their training in high school or in college that would empower [them] to understand and to judge when someone else is basically just full of it. Science is like an inoculation against charlatans who would have you believe whatever it is they tell you. Neil deGrasse Tyson, Late Night with Jimmy Fallon, June 24, 2009. Let us not fool ourselves into thinking we went to the Moon because we are pioneers, or discoverers, or adventurers. We went to the Moon because it was the militaristically expedient thing to do. Neil deGrasse Tyson, Sky Is Not the Limit, p. 70. 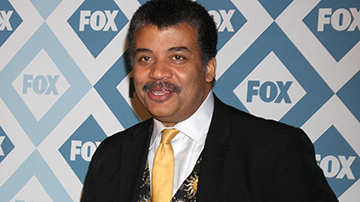 Neil deGrasse Tyson is an American astrophysicist, cosmologist, author, and science communicator. He is currently the Frederick P. Rose Director of the Hayden Planetarium at the Rose Center for Earth and Space and a research associate in the department of astrophysics at the American Museum of Natural History. From 2006 to 2011, he hosted the educational science television show NOVA ScienceNow on PBS and has been a frequent guest on The Daily Show, The Colbert Report, and Real Time with Bill Maher. Since 2009, he has hosted the weekly radio show Star Talk. In 2014, Tyson hosted the television series Cosmos: A Spacetime Odyssey, a sequel to Carl Sagan’s 1980 series Cosmos: A Personal Voyage.